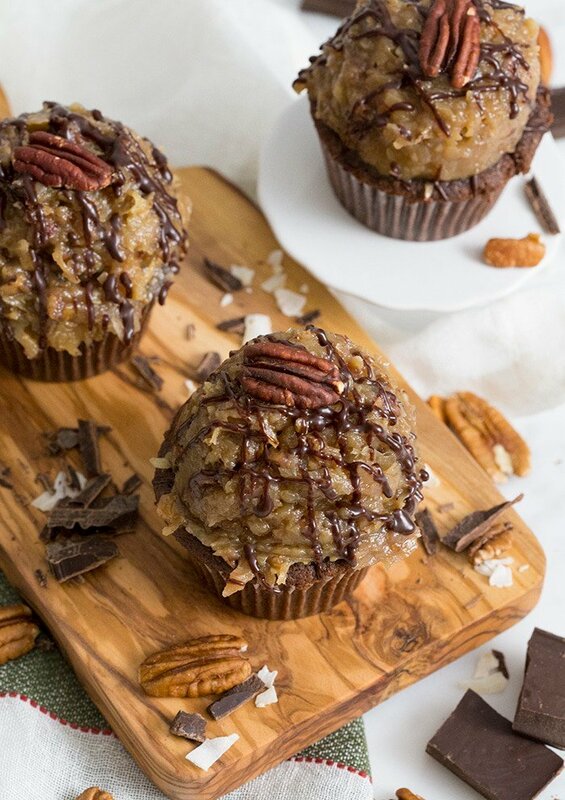 What could be better than German chocolate cupcakes piled high with coconut pecan frosting? Oh yeah, probably filling them with a delicious bourbon chocolate ganache. Mouth watering already? Just wait until they’re fresh out of the oven. 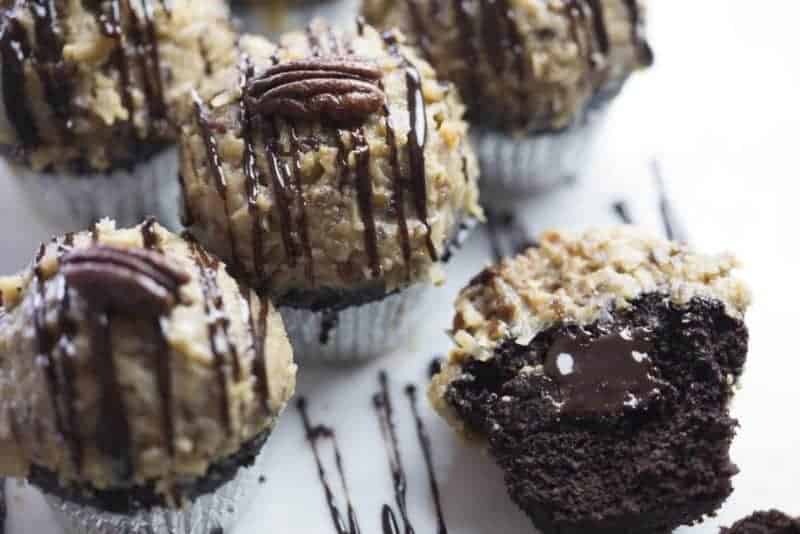 What could be better than German chocolate cupcakes? Oh yeah… maybe filling them with a delicious bourbon chocolate ganache! Yum. Don’t they look scrumptious? How Do You Make German Chocolate Cupcakes? For the ganache; put the chocolate chips in a small bowl with the bourbon. Heat the cream in a small saucepan until it begins to bubble. Pour it over the chocolate chips and allow it to sit for a minute or so and then whisk it together until there are no lumps. For the assembly; use a cupcake corer to carefully remove the core of the cupcake and set it aside. Pour the ganache into the cored cupcake holes then place the piece of the cupcake back on top to close off the hole. Using an ice cream scooper, cover the tops with the coconut frosting mix. Drizzle the top of the frosted cupcake with more ganache and add a candied pecan to the top of each cupcake. Enjoy! 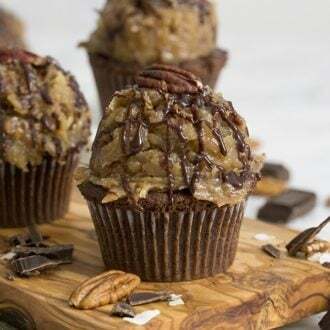 If you’ve tried these German chocolate cupcakes then don’t forget to rate the recipe and let me know how you got on in the comments below, I love hearing from you! Rich German chocolate cupcakes with a chocolate, bourbon ganache surprise inside! Preheat oven to 350 degrees F (180 degrees C) and place oven racks in the upper and lower third of the oven. Add cupcake papers to a cupcake pan. Sift the flour, cocoa powder, baking powder, baking soda, and salt into a medium bowl. In a small bowl, combine the milk and the sour cream. In the bowl of your electric mixer, or with a hand mixer, beat the butter until smooth and creamy. Add the sugar and continue beating until the mixture is fluffy (this will take about three to five minutes). Scrape down the sides of the bowl as needed. Add the eggs, one at a time, mixing well after each addition. Add the milk/sour cream mixture and flour mixtures in three additions, beginning and ending with the flour mixture. Beat only until the ingredients are mixed together. Divide the batter evenly among cupcake papers. Bake for about 15 minutes or until a toothpick inserted in the center comes out clean. Remove from oven and place on a wire rack to cool for about 15 minutes. Cool the cupcakes completely before frosting. Core the cupcakes with a corer. Preheat the oven to 350 degrees F (180 degrees C). Place the pecans on a baking sheet and bake for about 8-10 minutes. Thereafter, chop until fairly fine. Heat the cream in a small sauce pan until it begins to bubble. Pour over the chocolate chips and allow to sit for a minute or so. Whisk together until there are no lumps. Pour in the bourbon. Mix. Pour ganache into cored cupcake holes. Cover the tops with coconut frosting mix. Add candied pecans to the top of each cupcake. This looks great! 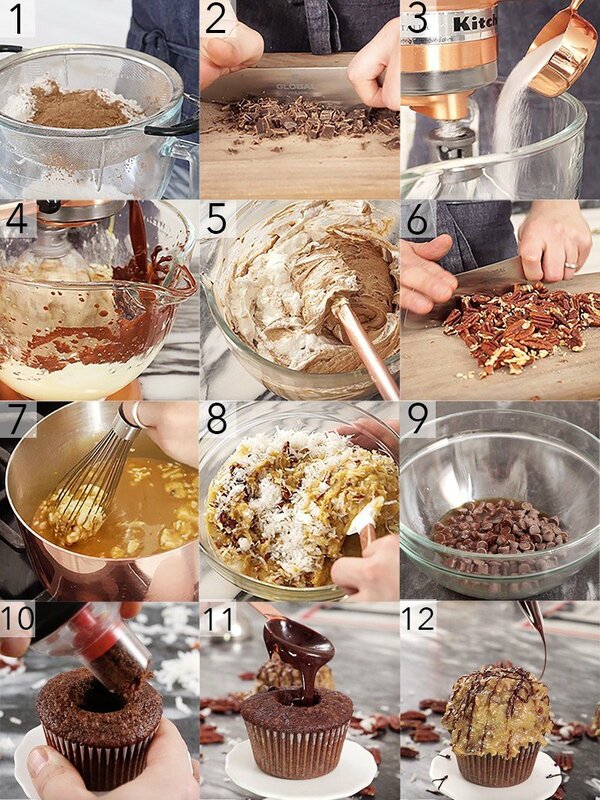 Can you post the directions for how to mix the ingredients to make the cupcakes? It looks so moist and good that I’d hate to ruin it because I did something wrong! Hi Zua — The page has been updated. Take a look and let me know what you think! Thanks, John. Hi Sanaya — The page has been updated. Take a look and let me know what you think! Thanks, John. I stumbled on here today and I must say I’ve never attempted GCC before because the frosting intimidated me – but you’ve broken it down so well – adorable cupcakes! Where is the coffee in the ingredient’s list? Hi Maimai — The recipe has been updated. Thanks! Best, John. The instructions say to add melted chocolate but it’s not in the cake ingrediaent list…how much melted chocolate?! Use 1/2 cup semi-sweet chocolate chips for the melted butter! There is overlap in the text at one point I️. The directions. Can you send me a copy? Making today for a birthday!!! 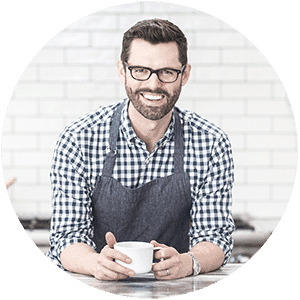 The recipe is updated! I hope you enjoy making these cupcakes! Hi it says to add melted chocolate to the batter but it doesn’t list it in the ingredient list. Is it required? The chocolate ganache is very tasty, but not required! Hope you enjoy! and how much bourbon for the GANACHE??? Use as much bourbon as you would like for the ganache! I used a few tbsp! Hope you enjoy! Hello! I’m in the middle of making these cupcakes and the directions say to add melted chocolate into the cake batter and there is no chocolate listed in the cake ingredients!! How much melted chocolate for the cake batter? Is there supposed to be coffee as well?